Knee replacement surgery will reliably diminish or relieve pain, correct any deformity and improve the patient’s ability to walk long distances and to climb and descend stairs. It is common for patients to have some residual symptoms and discomfort in the knee even though the severity of the pain will have been dramatically reduced. The range of flexion is usually not improved and many patients will continue to have difficulty kneeling. Most patients will notice a clicking sensation in the knee that may diminish with time but will never go away completely. It is therefore important for the patient to have realistic expectations concerning what can be achieved. It is unlikely that patients would be able to run after the procedure. There will be an area of permanent numbness on the outer part of the knee although a patient’s perception of this diminishes with time. Although a knee replacement is a very successful operation for most patients there is a small percentage of patients who are not satisfied with their surgery where no obvious cause for this can be found. There are several important factors that can lead to a smoother and less stressful recovery. These are listed below. At the consultation patients will be given an explanation of knee replacement surgery, including the expected recovery time. Patients are welcome to contact the staff at KOG about any further questions or for any clarification of information given in the consultation. A further consultation with the surgeon can be made if there are still any questions or concerns. At the time of the consultation patients will be given a prescription for Lyrica 75mg. This drug is usually used to help patients with chronic pain but is also very helpful in managing the pain associated with this procedure. Patients are asked to commence taking one Lyrica tablet daily for five days before the operation. The dose will be increased to one tablet twice daily for ten days post operatively. 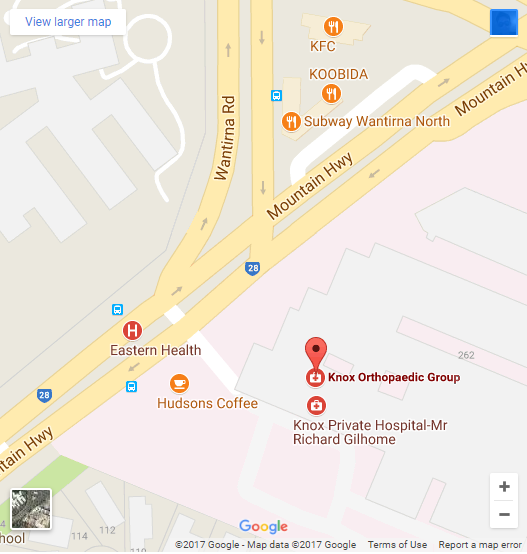 Approximately one week prior to surgery an appointment will be made to attend a pre-operative education session at Knox Private Hospital. This education session will be conducted by experienced nurses and physiotherapists. Attendance at this session gives patients the opportunity to be well informed and thereby diminish fear and anxiety about the procedure. The operation takes approximately one and a half hours and is done through a longitudinal incision measuring 15 to 20 centimetres. Antibiotics are given to reduce the risk of infection along with the introduction of antiseptic fluid during the procedure. The worn out cartilage and bone are removed with bone cuts. There are three methods for aligning the bone cuts accurately. The first involves using standard instrumentation. This has been used for many years and results in about 75% of optimal positioning of the prosthesis. 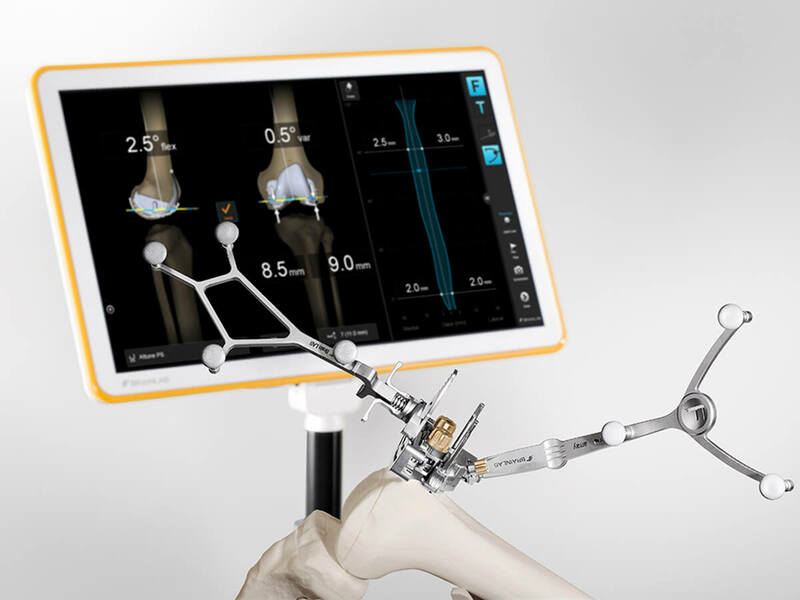 There are two newer methods that improve this accuracy to over 85% of prostheses being optimally positioned. 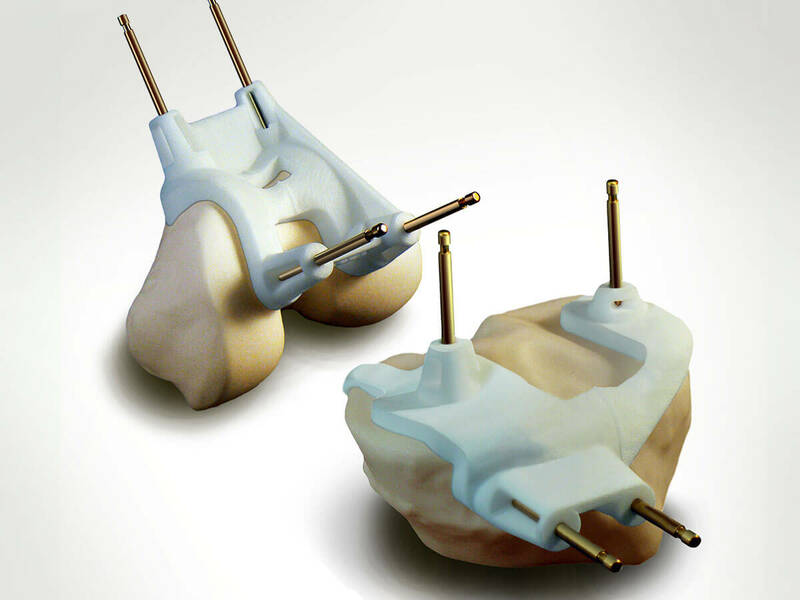 The first of these newer methods involves making a 3-D print of the patient’s knee. Patient specific cutting blocks are then made precisely to fit the patient’s knee according to the pre-operative planning. This will require the patient to have an MRI or CT scan four to five weeks prior to the surgery. The scan is sent digitally to Europe and the cutting blocks are made after the surgeon has performed computer assisted pre-operative planning. Fig 1: Patient specific 3-D models and cutting blocks. The second new technique involves computer assisted bone cuts done at the time of the surgery. This is done with the assistance of infra-red navigation. 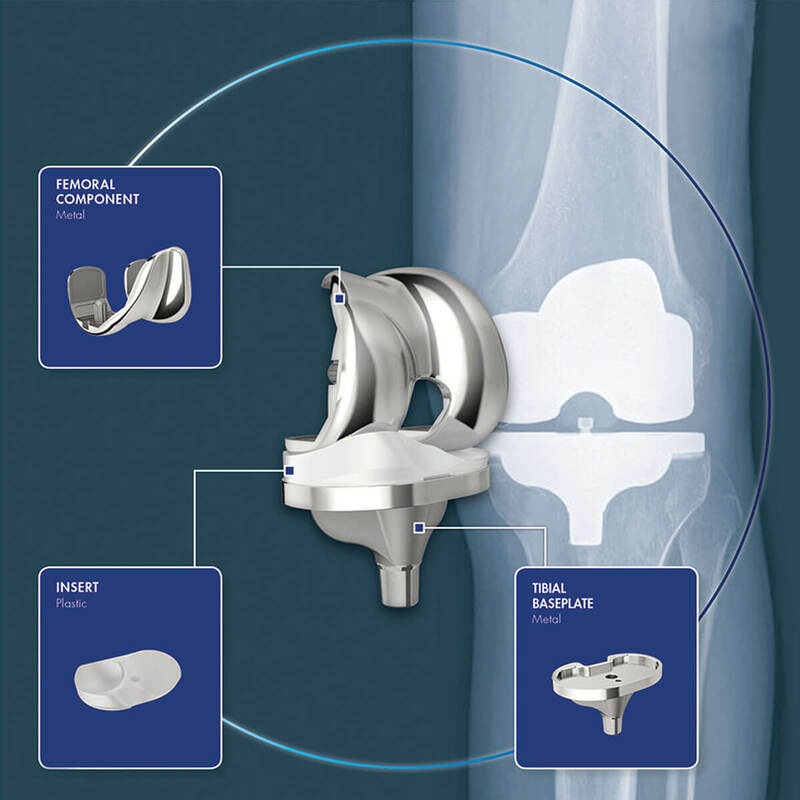 Fig 2: Computer assisted Knee replacement instrumentation. The surgeons at KOG only use these newer and more accurate techniques for cutting bone during knee replacement surgery. Both of these newer techniques have benefits and the final decision will be discussed with patients at the time of consultation. Two or three prosthetic components are inserted. The tibial component comprises a stemmed metal tibial plate onto which a polyethylene plastic spacer is inserted. The femoral component is made of metal and replaces the original shape of the femur in its pre-arthritic condition. See Figure 3 & 4. Sometimes a dome shaped piece of polyethylene is used on the back of the patella. There are a multitude of designs of knee prostheses but so far there has not been a significant difference in long-term performance of any particular prosthesis. The prostheses used by the surgeons at KOG all have very satisfactory results as shown on the Australian Joint Replacement Registry. A spinal anaesthetic is most commonly used for knee replacement surgery. It is often combined with sedative medication or a light general anaesthetic. Patients are given a mixture of different pain killing drugs to minimise post-operative pain. In addition, a catheter is inserted into the wound at the end of the operation. Local anaesthetic will be administered at intervals through this catheter for the first two days. This regime significantly reduces the level of postoperative pain. Patients will be encouraged to get out of bed on the day of surgery. Moving early after surgery is the most effective way of diminishing the risk of DVT and pulmonary embolus. For the first 24 hours post operatively the patients will be fitted with foot pumps and TED stockings. These measures further reduce the risk of DVT. Aspirin or other blood thinners will be prescribed. There will be significant swelling and sensation of warmth in the knee that may last several weeks. Walking aids such as crutches or a frame will be used initially, but patients are encouraged to discard their walking aids once they are able to walk comfortably without a significant limp. Most patients are able to go home between 4 to 6 days. Patients who live alone or have other medical conditions may need to go inpatient rehabilitation. This is usually at Donvale Hospital or Victorian Rehabilitation Hospital. An appointment will be made to see your surgeon six weeks after surgery. Blood thinning medication and the use of simple postoperative measures, including stockings and foot pumps will help minimise the incidence of this complication. The risks and consequences of DVT will be discussed with the patient at the time of consultation. Superficial infection is not common and usually responds well to antibiotics. Deeper infection is rare but has serious consequences. It will require further surgery and prolonged use of powerful antibiotics. This is a rare complication of knee replacement. It may result in weakness in the foot and ankle. In most instances it is temporary. There will however be numbness on the outer part of the knee to a varying degree. This is because small nerves supplying this area of skin are cut with the incision.